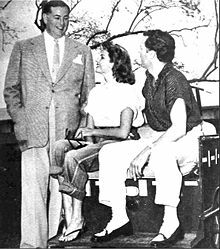 Jack Entratter (February 28, 1913 – March 11, 1971), nicknamed "Mr. Entertainment", was an American business executive. He is best known for management positions at the Copacabana nightclub in New York City in the 1940s and early 1950s, and at the iconic Sands Hotel and Casino in Las Vegas from the early 1950s. 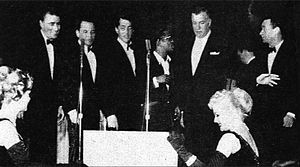 He is closely associated with Frank Sinatra and the Rat Pack in the history of Las Vegas, Nevada. Born to a Jewish family, Entratter began working in the French Casino in Miami, Florida as a reservation clerk as a teenager. He later worked as a bouncer at the Stork Club in New York City in the 1930s. In 1940, he was appointed as an assistant to Jules Podell at the Copacabana nightclub, and was later general manager of the club. By 1949, he had a controlling interest in the nightclub, and he was still at the club in July 1952. 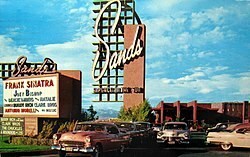 Entratter became general manager of the Sands Hotel and Casino in Las Vegas when it opened in December 1952. At the time, it was the most luxurious hotel on the Las Vegas Strip and among the world's best hotels. Entratter made many show business friends during his time as a manager at the Copacabana, where he gained renown for his smoothness in dealing with its performers and patrons. He was able to use these connections to sign performers for the Copa Room at the Sands, a nightclub that he built especially for Sinatra. Entratter offered entertainers an additional incentive to perform at the Sands. Headlining stars received "points", or a percentage of ownership in the hotel and casino. Entratter's personally selected "Copa Girls" wore $12,000 worth of costumes on the hotel's opening night (equivalent to $113,000 in 2018). This surpassed the salary of the Copa Room's star, Danny Thomas. Due to the American Mafia involvement in the development of Las Vegas, Entratter was associated with mobsters such as Meyer Lansky and Hyman Abrams in the financing of the Sands, which he ran with Carl Cohen, who was its entertainment director and vice president. Nancy Sinatra wrote in her 1986 autobiography: "Sands was the place. Jack Entratter, Nick Kelly, Carl Cohen, they were quite a team. They knew what talent to book, what food to serve. They also knew how to be generous, and they weren't afraid to be. There were always free drinks for the gamblers". Entratter was still the manager of the Sands in 1966 when Sinatra's live album, Sinatra at the Sands, was recorded, as during the "Tea Break" Sinatra mentioned that Entratter had told him that many of the hotel suites of the new hotel block being built at the time would be given names to glamorize it, including the Danny Thomas, Red Skelton and Dean Martin suites. Entratter was married to Dorothy James until her death in 1961; they had two daughters, Caryl Entratter Palin and Michelle Entratter Walkoff. His second wife was model and actress Lari Laine (Corinne Cole). He was described as being a large man of 6 feet 4 inches (1.93 m) in height and 240 pounds (110 kg) in weight, with a "deep, baritone voice". He reportedly had a "slightly menacing character with the demeanor of an ex-boxer", yet was "smooth and courtly" to those he liked. Known as "Mr. Entertainment", Entratter did not drink alcohol, and he was not a gambler or smoker. Entratter served as congregation president of Temple Beth Sholom from 1959 through 1963, and again in 1966. In film, Entratter appeared as himself in Pepe (1960), and served as a technical advisor on Sinatra's 1955 film, The Man with the Golden Arm. ^ Leigh 2015, p. 217. ^ a b Klein 1997, p. 228. ^ "Jack EntratterJack Entratter". UNLV Libraries Southern Nevada Jewish Heritage Product. Retrieved June 29, 2018. ^ a b c "Jack Entratter and the Copa Girls". University of Nevada. Las Vegas. Retrieved November 9, 2015. ^ a b c d Weatherford 2001, p. 11. ^ a b Fishgall 2010, p. 108. ^ a b c Papa 2009, p. 73. ^ Kelley 1986, pp. 168–169. ^ The Saturday Evening Post. Curtis Publishing Company. July 1952. p. 114. ^ Alexander 2013, p. 62. ^ Weatherford, Mike (February 7, 1999). "Frank Sinatra". Las Vegas Review-Journal. Retrieved November 9, 2015. ^ Balboni & Edwards 2006, p. 27. ^ Sheridan 2011, p. 55. ^ Sinatra 1986, p. 109. ^ "Jack Entratter of Las Vegas, 57". New York Times. March 12, 1996. ^ Kuhns 2013, p. 238. ^ Nash 2014, p. 170. ^ Marschall 2008, p. 182. ^ Milne 2009, p. 717. ^ "The Man With The Golden Arm". TCM. Retrieved November 9, 2015. Wikimedia Commons has media related to Jack Entratter. Alexander, Linda J. (July 2013). A Maverick Life: The Jack Kelly Story. BearManor Media. GGKEY:277941FZ6T0. Balboni, Alan Richard; Edwards, Jerome E. (2006). Beyond the Mafia: Italian Americans and the Development of Las Vegas. University of Nevada Press. ISBN 978-0-87417-681-0. Fishgall, Gary (15 June 2010). Gonna Do Great Things: The Life of Sammy Davis, Jr. Simon and Schuster. ISBN 978-1-4391-3157-2. Kelley, Kitty (1986). His Way: The Unauthorized Biography of Frank Sinatra. Bantam Books Trade Paperbacks. ISBN 978-0-553-38618-9. Klein, Edward (1997). All Too Human: The Love Story of Jack and Jackie Kennedy. Simon and Schuster. ISBN 978-0-671-50191-4. Kuhns, Bradley W. (19 April 2013). A Music Journey Remembered "The Life and Times of Brad Evans, Musician". Bradley Kuhns. ISBN 978-0-944647-58-5. Leigh, Spencer (25 September 2015). Frank Sinatra: An Extraordinary Life. McNidder and Grace Limited. ISBN 978-0-85716-088-1. Marschall, John P. (2008). Jews in Nevada: A History. University of Nevada Press. ISBN 978-0-87417-737-4. Milne, Jeff (20 July 2009). Six Degrees of Kevin Bacon: The Complete Guide to the Movie Trivia Game. Jeff Milne. ISBN 978-0-615-28521-4. Nash, Alanna (1 March 2014). The Colonel: The Extraordinary Story ofÂ ColonelÂ Tom Parker and Elvis Presley. Aurum Press. ISBN 978-1-78131-201-8. Papa, Paul W. (1 October 2009). It Happened in Las Vegas: Remarkable Events that Shaped History. Rowman & Littlefield. ISBN 978-0-7627-5819-7. Sheridan, John Harris (6 September 2011). Howard Hughes: The Las Vegas Years: The Women, the Mormons, the Mafia. AuthorHouse. ISBN 978-1-4634-0693-6. Sinatra, Nancy (1986). Frank Sinatra, My Father. Simon and Schuster. ISBN 978-0-671-62508-5. This page was last edited on 30 June 2018, at 04:02 (UTC).